Apple's mid-range iPod, discontinued on July 27, 2017. The iPod nano was discontinued in July 2017 after receiving its last significant update in September 2012, although color options were updated several times through 2015. Subscribe for regular MacRumors news and future iPod nano info. On July 27, 2017, Apple removed the iPod nano from its website and online store, marking its discontinuation after almost twelve years on the market in various form factors. With the simultaneous discontinuation of the iPod shuffle, the iOS-based iPod touch is the only remaining device in the iPod family. At the time of its discontinuation, the iPod nano was available in six colors in a single 16 GB capacity priced at $149. 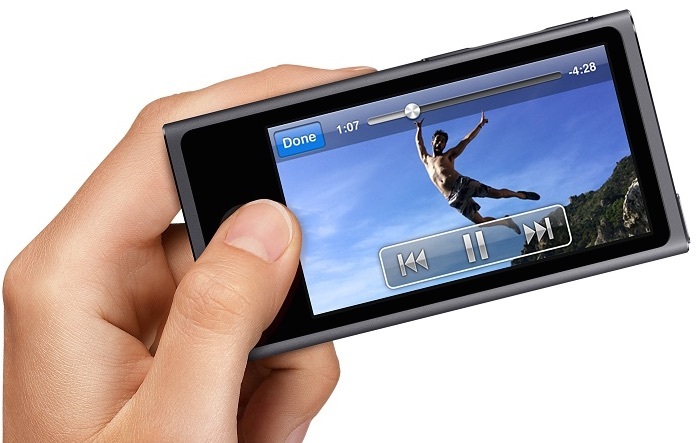 Perhaps more than any other iPod product, the iPod nano was the subject of significant experimentation by Apple, with the company trying out a number of different form factors based on a click wheel interface before moving to an iPod shuffle-shaped design centered around a multi-touch screen and eventually settling on a design more like a miniature iPod touch with the final seventh-generation models released in October 2012. The final design included a 2.5-inch multi-touch screen and a small home button similar to that found on iOS devices, while incorporating 16 GB of storage at a price of $149. The iPod nano did not, however, run iOS and instead ran custom software designed to look somewhat like iOS. The models supported video playback, Bluetooth 4.0 connectivity, and Apple's Lightning connector, but did not include cameras of any sort. 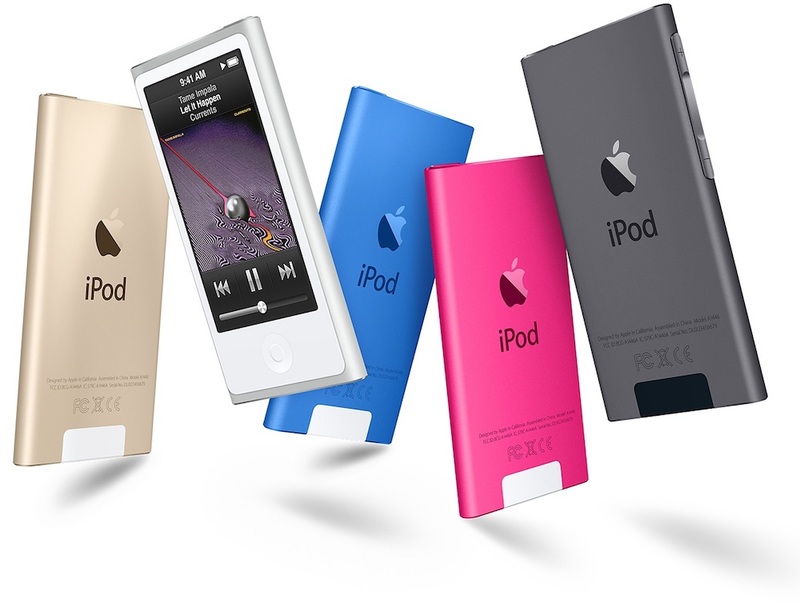 The September 2012 introduction of the seventh-generation iPod nano included eight different color options: slate, silver, pink, yellow, green, blue, purple, and a special (PRODUCT) RED version. September 2013 saw only the replacement of the slate color option with a new "space gray" color that was highlighted on the iPhone 5s but also quietly brought to the iPod touch, iPod nano, and iPod shuffle. 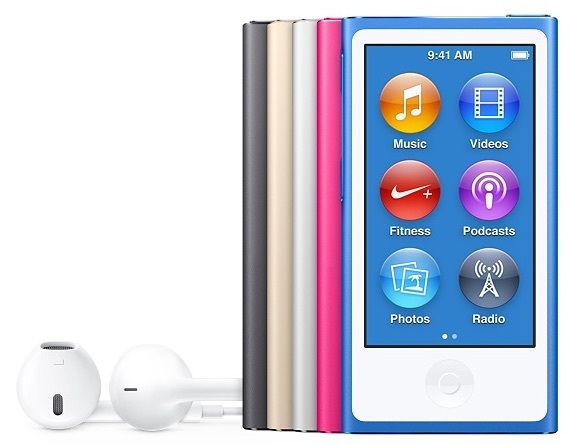 A July 2015 update saw a more substantial change to the iPod nano's color options, with gold and new shades of blue and pink joining the silver, space gray, and red options carried over from the previous lineup.